There is a rapidly growing Mexican-American population in the Dallas-Fort Worth area. Sol Villasana, the author of Dallas's Little Mexico, wrote that "Mexicans have been part of Dallas since its beginning." In the 1870s the first significant groups of Mexicans came to Dallas as railroad lines were constructed. Additional Mexicans settled Dallas as a result of the Mexican Revolution, which began in 1910. According to the 1920 U.S. Census, 3,378 Mexicans lived in Dallas. In the early 20th century, wealthier Mexicans lived in Little Mexico and in the historical red-light area of Dallas north of Downtown, while less wealthy immigrants lived along railroad yards. Caroline B. Brettell, author of '"Big D" Incorporating New Immigrants in a Sunbelt Suburban Metropolis,' wrote that as of 1920 the majority of Dallas's Mexicans "were living in atrocious conditions." After World War II Little Mexico began to disintegrate. In 2009 the City of Dallas began pursuing an EB-5 investment program, attracting wealthier Mexicans. By 2012 there was a wave of wealthy Mexican immigration, due to the program, the proximity and access of Mexico to North Texas, and the violence of the Mexican drug war. As of the 2000 U.S. Census, 71% of the foreign-born residents of Dallas originated in Mexico, as were 64% of the foreign-born residents of McKinney, and 22% of the foreign-born residents of Plano. As of the 2000 U.S. Census, 63% of the ethnic Mexicans in Dallas County resided in the Dallas city limits. Many Mexicans in Dallas live in lower income housing, especially in South Dallas. As of 2000 there was a large group of ethnic Mexicans living north of Arlington in an area south of Interstate 30, and a smaller group in the cities between Dallas and Fort Worth south of U.S. Highway 183. As of 2012 there are about 20 daily flights between Dallas-Fort Worth International Airport and Mexico. El Fenix, a Tex-Mex restaurant chain, was established by Mike Martinez, a Mexican American. It was established on September 15, 1918. Christina Rosales of The Dallas Morning News wrote that it "has been credited with starting the Tex-Mex craze in the U.S."
Pizza Patrón, headquartered in Dallas, markets itself to Mexican American families. It was established by Antonio Swad, a person not of Mexican origins. Brettell, Caroline B. '"Big D" Incorporating New Immigrants in a Sunbelt Suburban Metropolis' (Chapter 3). In: Singer, Audrey, Susan Wiley Hardwick, and Caroline Brettell. Twenty-First Century Gateways: Immigrant Incorporation in Suburban America (James A. Johnson metro series). Brookings Institution Press, 2009. ISBN 9780815779285. Start p. 53. Villasana, Sol. Dallas's Little Mexico (Images of America). Arcadia Publishing, 2011. ISBN 9780738579795. 1 2 3 Villasana, p. 7. 1 2 Brettell, p. 56. 1 2 Corchado, Alfredo. "High-end migrants from Mexico lead new wave to Dallas area" (Archive). The Dallas Morning News. November 24, 2012. Updated November 25, 2012. Retrieved on September 22, 2014. 1 2 3 Brettell, p. 61. ↑ Rosales, Christina. 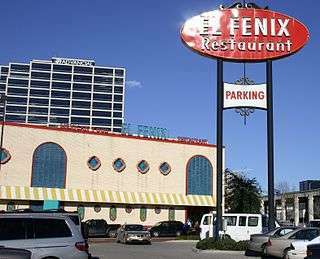 "Dallas-based El Fenix restaurants celebrate 93 years of Tex-Mex tradition." The Dallas Morning News. September 20, 2011. Updated September 21, 2011. Retrieved on September 21, 2014. ↑ Meraji, Marisol Shereen. "Pizza Chain That Markets To Mexicans Says New Promotion Isn't Profane" (Archive). National Public Radio. March 15, 2014. Retrieved on September 22, 2014. Cordell, Dennis D. (Southern Methodist University) and Manuel Garcia y Griego (University of Texas at Arlington). "THE INTEGRATION OF NIGERIAN AND MEXICAN IMMIGRANTS IN DALLAS/FORT WORTH, TEXAS" (Archive) - International Union for the Scientific Study of Population (IUSSP) XXV International Population Conference, 2005. Working paper. Watson, Walter T. "Mexicans in Dallas." Southwest Review 22 (1937): p. 406. Cloer, Katherine. Advisor: Roberto R. Calderon. "A champion for the Chicano community: Anita N. Martínez and her contributions to the city of Dallas, 1969–1973." ProQuest Dissertations and Theses, 2011.